If you are a Paypal Indian customer, your life with Paypal is officially over thanks to the Reserve Bank of India (RBI) and the Indian Government. You would have received an email to this effect already and would have realised that the Paypal account you so cherished is now just a wormhole to bring money into your bank account. You cannot use your earnings to purchase stuff on the Internet. So you can no longer use the hard earned money from your website to purchase hosting or to pay for the domain name of the said website. Under normal Indian Tax laws, these are perfectly acceptable uses for your earned money and infact are even deducted for the purpose of calculating taxable income from your business/service. The intentions of the Government are pretty clear. They want all this forex in Indian accounts but they dont want to give any leeway to Indians who are earning this money. A sad day in cyberspace for Indians indeed. • Any proceeds or earnings received into your PayPal account from the export of goods and services should be withdrawn to your bank account within 30 days. • While making the withdrawal please make sure you select the purpose code that best fits your business. • Any proceeds or earnings received into your PayPal account from the export of goods and services may only be withdrawn to your bank account in India. This received amount cannot be reused for making purchases. 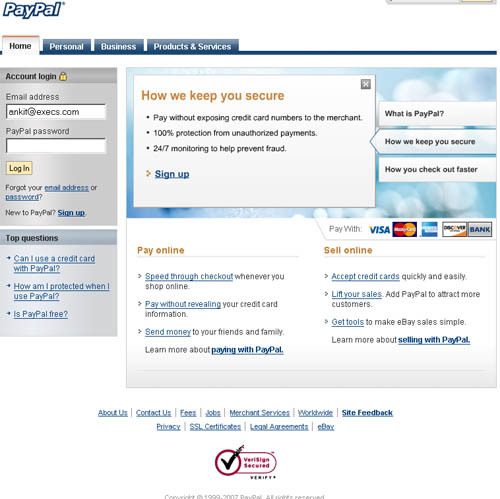 • If you would like to make purchases on any website that accepts PayPal, you can continue to use any credit card issued by a bank in India. If you do use an Indian credit card to pay via Paypal it would actually mean double payment of commission to Paypal , once at time of receiving the forex and next time at the time of sending it since Paypal earns a lot through forex rates. Its not Paypal’s fault though, its obvious the Indian Government and RBI had a larger role to play in this fiasco. Good news for Indian publishers whose cheque got stolen or lost many times, so much so that they had to pay the high charge of $25 extra for secured DHL delivery. Google has decided to dump the Indian postal department in favour of Bluedart. In what should come as a big disappointment to the postal department, lakhs of cheques which are issued each month will no longer be sent via the Indian Postal System. Indian publishers who access the my account tab will be able to see that the secured delivery via DHL option is no longer there and only a local courier option is there. These couriers will be sent via Bluedart which is infact one of the fastest domestic couriers of India and probably pretty reliable too as banks frequently trust them with their credit cards etc. But Google is still tightlipped about electronic fund transfers for India, we heard its due to taxation issues and laws,lets see how this new Blue Dart saga turns out for Google and its Indian publishers when they start receiving Bluedart cheques from next month. “AdSense publishers in India will receive standard delivery checks mailed via the local courier service Blue Dart for no additional charge. Cheques mailed by Blue Dart should arrive within 10-30 days of the cheque date. So the Secure Payment option has been removed from all the Indian adsense publishers account. Well IBibo has started a new contest in which you can win if you create a poll interesting enough to get the maximum number of votes, also if you have voted for the poll with the highest number of votes, again you can win ! Current prizes are Nokia 3230 for creating the poll with maximum votes, or Nokia 2626 if you are a lucky voter in the poll with maximum votes. This can be an easy way to earn a new mobile phone, just got to think of a question controversial enough ! Contest is open to Indian Citizens only !